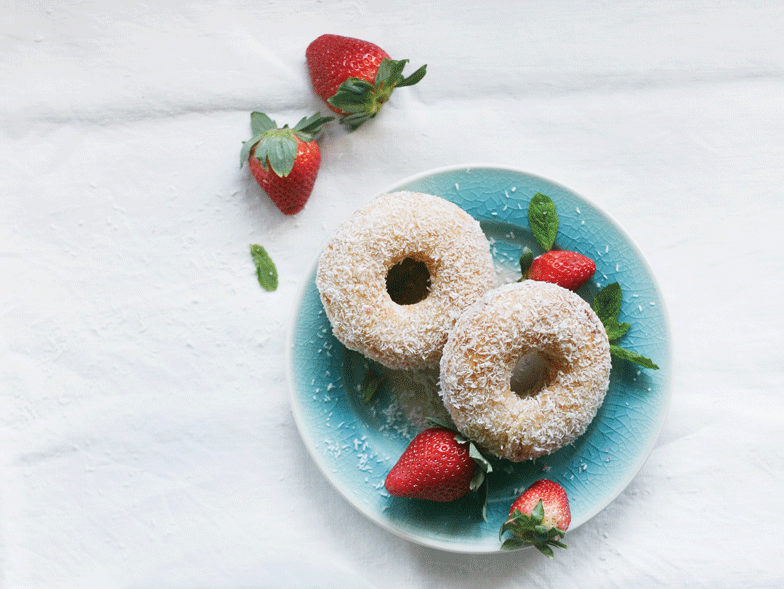 Though beloved, doughnuts have a reputation as one of the sugariest breakfast treats. While it’s true that most doughnuts are packed with sugar, there is a way to enjoy them without all of the sweet pink frosting and sprinkles. This recipe uses good-for-you ingredients like gluten-free flour, applesauce and coconut milk, for a natural way to get your morning sugar rush. Preheat the oven to 350°F. Grease and flour a 6-well doughnut pan. In a large bowl, sift together the flour, sugar, stevia, baking powder, baking soda, and salt. In a medium saucepan, warm the coconut milk and ⅓ cup of coconut oil over low heat until the oil melts (do not allow to boil), mixing gently with a wooden spoon. Remove from the heat, and stir in the applesauce and vanilla. Pour the liquid mixture into the dry ingredients, and mix gently. If clumps develop,use an immersion blender or mixer, and mix until very smooth. Stir in ½ cup of the coconut flakes. Pour the batter into the doughnut pan, filling about halfway to allow for rising. Bake for 15 minutes. Remove from the oven, and allow to cool for 15 to 30 minutes. Gently scrape the sides of each well, and flip the pan to turn the doughnuts out. Use a toothpick to help them lift out, if needed. In a small bowl, mix the rice malt syrup and the 2 tablespoons of melted coconut oil together until well combined. Coat the doughnuts thinly with the icing, and press onto the remaining coconut flakes to coat all over. Make one tart with these topping ingredients, and have fun changing up the ingredients on the other tart. Or freeze the second half until next time. Sift and mix all the flours together. Add the salt and sugar and mix to distribute evenly. Fold in the cold shortening and/or vegan butter and cut through the flour with a pastry cutter. (You can also pulse these ingredients in a food processor for a faster method.) Once crumbles form, create a well and slowly pour in ice-cold water, just a little at a time. Continue folding and cutting and adding more water a few tablespoons at a time until a dough forms. Keep dusting the work surface as well as your hands with some extra rice flour so the dough doesn’t stick. Do not over mix as little areas of fat from the shortening/butter are necessary to achieve a lightness in the pastry. Lay down a sheet of parchment paper out on a baking sheet. Place 1/2 of the dough onto the sheet and press down gently with your fingers to spread it out onto the sheet. You could also use a rolling pin to press it down faster down to about 1/2 inch height. Shape into a rectangle or any shape you like. Be sure to round the edges a bit so they are not too thin and flaky by simply going around the edges and gently pushing the dough back into the center. This will strengthen the sides more and help you even out the shape into straighter lines. For the toppings, place the sliced tomatoes, red onion and drained black beans into a shallow large bottom bowl and drizzle with a little olive oil and season with a little sea salt and fresh ground pepper. Gently toss them to let the oil coat the sides. Drizzle the top of the dough with a little olive oil and place tomato slices all over, followed by onion slices, black beans and fresh rosemary. Bake at a preheated oven for 35-45 minutes or until crust edges appear nice and golden. Masking your own cheese ball from cashew nuts is incredibly easy and so delicious– and so healthy. This is a great addition to a party buffet table. You and your guests will love it. Put cashews in a bowl of cool water and cover with plastic. Place the bowl in the refrigerator and leave to soak for 12 hours. Drain the water and add the nuts to the blender. Add minced garlic, garlic powder, lemon zest, lemon juice, water, nutritional yeast, salt and olive oil. Blend until smooth, and adjust seasoning based on your personal taste preference. Use a fine mesh strainer (over a mixing bowl) and lay down two layers of cheesecloth or a clean, absorbent towel. Scoop all of the cheese onto the cheesecloth with a spatula, before gathering the corners and twisting the top gently to form a cheese ‘disc.’ Use a rubber band to secure the shape. Place in the refrigerator and leave for 12 hours. Be careful when removing the cheese, and season with additional herbs to suit your preference. Enjoy your homemade cheese ball!